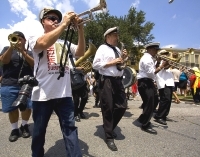 New Orleans turns out in style to celebrate Louis 'Satchmo' Armstrong, the city's most beloved son. Occurring every year in the week of the star's birthday, the line-up of free events honouring the man who promoted jazz around the world includes an outdoor music festival and local food. There are also seminars and discussion groups. There are also activities for children, art exhibitions, a jazz mass, parade and a club on the programme. Happily, most of the events are free to enjoy.